McDonald's McCafe line offers numerous beverages, including a frozen strawberry lemonade concoction. This beverage is created by blending together a lemonade base, a strawberry syrup swirl and ice. While this drink provides vitamin C and some calcium, it also contains a significant amount of calories and sugar. Because of this, those concerned about their caloric or sugar intake may wish to limit their consumption of the beverage. Each medium 16-oz. serving of McDonald's Frozen Strawberry Lemonade contains 270 calories. It does not contain any fat, cholesterol, fiber or protein. The total amount of carbohydrates in the beverage is 68 g. About 67 g of the 68 g of total carbohydrates come directly from sugar. The drink also contains 30 mg of sodium, 30 IU of vitamin A, 183 mg of vitamin C and 20 mg of calcium. The U.S. Food and Drug Administration has created daily values of certain nutrients to make it easier to determine if a product meets your nutritional needs. The 16-oz. Frozen Strawberry Lemonade at McDonald's contains 23 percent of the daily value of carbohydrates, 1 percent of the daily value of sodium, 310 percent of the daily value of vitamin C and 2 percent of the daily value of calcium. The beverage is not a significant source of any other vitamin or mineral. As of May 2011, the FDA has not established a daily value for sugar. However, the organization urges consumers to limit their consumption of sugar whenever possible. The nutrition facts are based on the medium 16-oz. serving size. A 12-oz. small size and a 22-oz. large size of the beverage are also available. Remember to always adjust the nutrition fact amounts based on the amount of the beverage you actually consume. 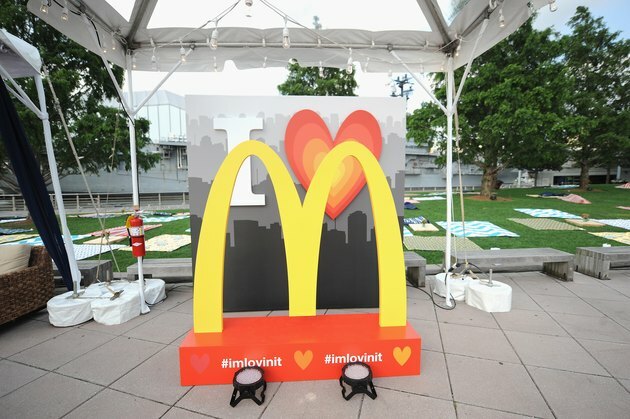 McDonald's Frozen Strawberry Lemonade contains milk ingredients, so those with a milk allergy or lactose intolerance should refrain from consuming this product. It does not contain any other common allergens. However, if you have an unusual food allergy or sensitivity, review the ingredients list of the beverage carefully before consuming, to avoid a potential reaction.